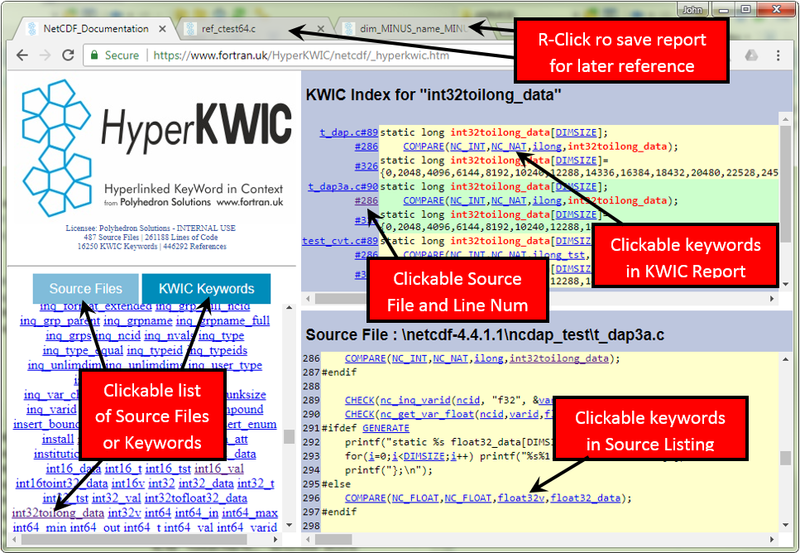 Software Documentation using HyperKWIC – Polyhedron Solutions Ltd.
You can interact with sample HyperKWIC reports for large Fortran and C programs by clicking here and here. HyperKWIC is available free of charge for not-for-profit, non-government use – and for evaluation by commercial users. A commercial licence is required to modify the licence information displayed at the foot of each report page. HyperKWIC is also included in the plusFORT toolkit. Download HyperKWIC for Windows, Linux or Mac by clicking here. Right-click to open a separate tab for reports you will need again later.